Different termination types require unique tools. There are some tools common for all types of connectors and some are specific to the connector type and tools termination kits. The essential tools include jacket stripper, buffer remover, aramid yarn scissors, polishing pad, polishing puck and more. Safety is paramount in fiber optic cabling and every termination must include: safety glass, dark mat and a properly marked container for safe disposal of broken optical fiber strands. We have everything you need to terminate scribe & polish (anaerobic adhesive) and scribe & polish (crimp), and cleave & secure (pre-polished) connectors. We also offer cleaning tools for LC, SC, and MTP® connectors. 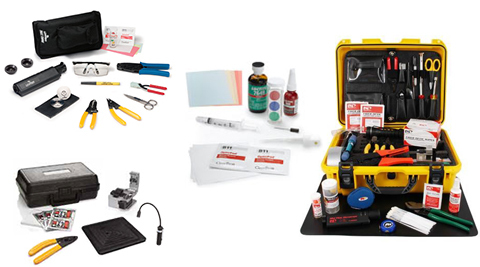 Choose from complete kits, or mix and match individual tools, and a wide variety of consumables. All these tool kits and consumables are available for both multimode and singlemode fiber.